The white gold Rolex Day-Date President truly marries understated elegance and unrivaled prestige. 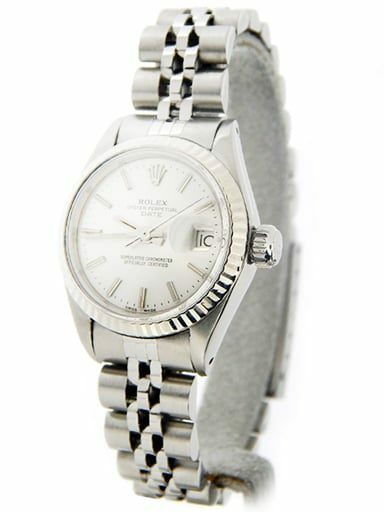 Now, you can browse our fine collection of Rolex President mens white gold watches. You will find our selection offers assorted dials, bezels, and bands with full diamond options. There is no doubt, we are confident that you will find a Rolex Day-Date President watch for your distinct style. Experience owning a mens Rolex President watch, but at a preowned Rolex President price. Also, each purchase receives a 30-day money-back guarantee, free U.S. shipping, and available financing. Keep in mind, we offer first-class customer service. So, please contact us if we can help you find your perfect watch. Ah, the look, the feel, the panache of a genuine, authentic Rolex watch. For some, buying that special timepiece is a lifelong dream. Wearing the Rolex brand symbolizes success, class and prestige. But alas, Rolex timepieces are only for the rich and famous. Or is it? Discover the best affordable luxury watches with the most trusted seller. We’re here to tell you that BeckerTime offers authentic preowned Rolex watches at prices more affordable than you may think.  With watch prices as low as $2,000, you can have the quality you’ve come to expect from Rolex, for a fraction of the original retail pricing. 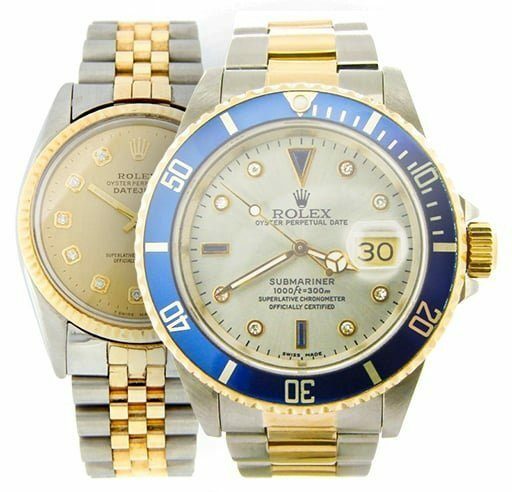 At BeckerTime, our business is selling preowned luxury Rolex timepieces. We enjoy helping even the most discerning of customers find their perfect Rolex watch. Also, we love that our customers can enjoy an authentic preowned Rolex timepiece, most with a one-year warranty, and take part in our Lifetime TradeUp Guarantee program. Finally, we love that they can do this while paying less than retail pricing on the exact same watch style and model! Now, some individuals feel strongly about having the box and papers that come with a Rolex watch. The first thing you should know about buying a preowned Rolex watch is that it may or may not come with the original box and papers. One of the biggest misconceptions in the industry is that a box and papers automatically means the Rolex watch is authentic. This couldn’t be further from the truth. In reality, anyone selling a fake Rolex can easily create or reuse the box and papers from another watch. What you have to trust is the seller, whether you’re buying new or preowned. For nearly 20 years, we’ve prided ourselves on selling certified, authentic preowned Rolex watches. We offer exceptional, personalized customer service. Furthermore, we’ve built a stellar reputation with the BBB, eBay, Yelp, Facebook and many more. Therefore, if you’re in the market for an affordable preowned luxury timepiece, look no further than BeckerTime.com. Let us help you choose from the best affordable luxury watches. 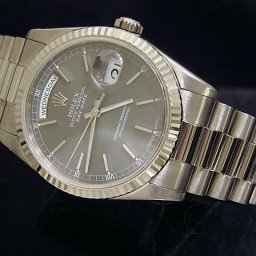 The perfect preowned Rolex watch will last you a lifetime. (And if at any time, you have eyes for another Rolex watch, you can simply take advantage of our Lifetime TradeUp Guarantee program.) Now, go fulfill that lifelong dream! Among all the Rolex Day Date President watches, the most subtle are the white gold versions. Due to a similarity in color, white gold is sometimes mistaken for stainless steel if seen from afar. Thus, you can argue that wearing a white gold Rolex Day Date President is more for the pleasure of the wearer than to show off the presence of a solid gold timepiece. 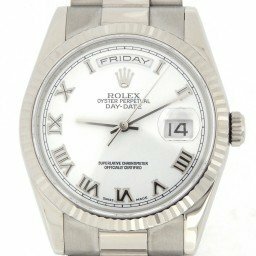 However, those familiar with Rolex aesthetics understand that the Swiss watchmaker exclusively uses gold or platinum for their Rolex President mens white gold watches—there are no steel versions available. Regardless if the Rolex is worn for status, personal enjoyment, or both, it’s hard to deny to appeal of the elegant and refined white gold Rolex Day Date President watch. Donning a classic 36mm Oyster case in 18k white gold topped with a fluted bezel and presented on the iconic semi-circular link President bracelet, it doesn’t get more sophisticated than this. Plus, let’s not forget about the practicality of the calendar windows that display the day and the date that the watch is named after. Let’s explore some key references of the white gold edition of the Rolex President. While Rolex certainly does not manufacture quartz models today, it was a different story in the 1970s. 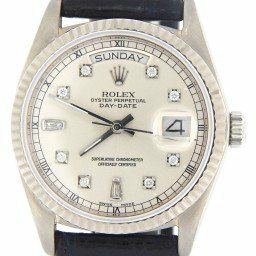 In 1977, Rolex unveiled the battery-powered white gold Oysterquartz Day Date ref. 19019. Like its automatic movement counterpart, the Oysterquartz ref. 19019 was constructed entirely in 18k white gold, sported a fluted bezel, and a dial with the day and date apertures. In contrast to the mechanical Day Date watches, however, the Oysterquartz version did not have a President bracelet, but rather a flat integrated bracelet that was very much in fashion during its era. In 1978, Rolex included the quickset feature to the automatic Day Date line to allow the wearer to adjust the date autonomously from the hour hands. Earlier versions of the Day Date did not include the quicket feature. Therefore, the center hands had to continuously turn past midnight until the correct date appeared in the window. 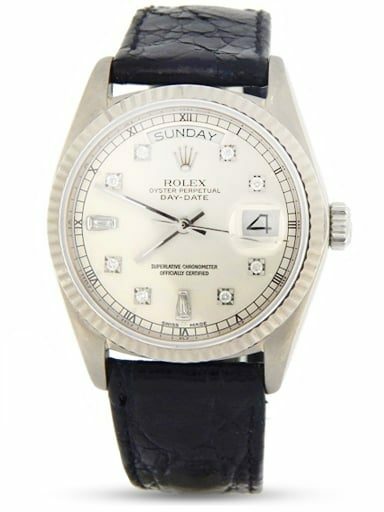 Additionally, the mens Rolex white gold Day Date ref. 18039 also had sapphire crystal protecting the face of the watch. Prior to the now ubiquitous sapphire crystal, Day Date watches—like all Rolexes—had an acrylic crystal on top of its Oyster case. If two is better than one, then the mens Rolex Day Date Ref 18239 offers twice the greatness thanks to its double quickset feature. 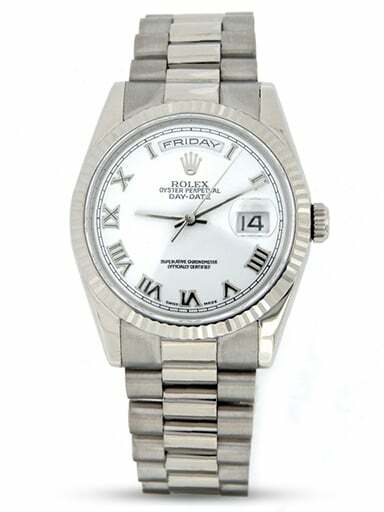 Introduced in 1988, the double quickset of the white gold Day-Date ref. 18239 permits the setting of both the day of the week and the date of the month without having to manipulate the center hands. 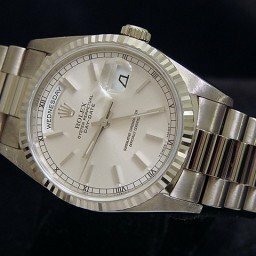 The most current version of the white gold President, the Day Date ref. 118239 made its debut in 2000. A fitting new luxury watch to celebrate the turn of the century, the President ref. 118239 came along with an enhanced bracelet. The new version of the President bracelet now boasts solid links. Not only does this make the bracelet even more lavish, but it also helps prevent stretching over time. In addition to the traditional 36mm size of the Day Date President, there are two larger models also available. The now discontinued white gold Day Date II President ref. 218239 dons a generous 41mm size case while the current white gold Day Date 40 President ref. 228239 flaunts a slimmer 40mm size case. This is the most discreet of Rolex’s quintessential luxury watches.